YNX Releases The Sea Turtles (Give It 2 Get It #24 Review) – Yannix(Thailand)Co.,Ltd. On Saturday, February 23, Yannix Volunteers participated in two events as part of the Give It 2 Get It Program. In the morning Yannix Volunteers visited the Thai Way of Organic Farming Learning Center (SEAL Farm) where they were hosted by Chief Petty Officer First Class Viratpon Masphan and his team. Volunteers toured sixteen stations across the 4.35 acre farm that produces organic rice, vegetables, and mushrooms. Volunteers also observed SEAL’s solar power system and interacted with the resident ducks. The volunteers then participated in a workshop to prepare organic salted duck eggs on the premises. These activities were all part of the plan so that volunteers could learn about “sufficiency economy,” a Thai development approach attributed to the late King Bhumibol Adulyadej’s “sufficiency economy philosophy,” that espouses a balanced approach to living. In the afternoon, the volunteers traveled to Samae-San Island, a small island in Sattahip District, Chonburi Province. The island is under the control of the Naval Special Warfare Command (SEAL), Royal Thai Fleet as part of an initiative that was launched by Her Royal Highness Princess Maha Chakri Sirindhorn. This initiative led to the establishment of the Siam Marine Rehabilitation Foundation. The Yannix group was greeted by their host Chief Petty Officer First Class Thongchai Chookhanhom who explained to the group about the importance of natural environment. The Yannix volunteers were especially honored by the presence of Mrs. Sasivimol Youkongkaew, (wife of Rear Admiral Apakorn Youkongkaew, Commander, Naval Special Warfare Command Royal Thai Fleet), who spoke to the group about Marine Nature Conservation and specifically how the Hawksbill Sea Turtles help maintain the health of coral reef. These sea turtles naturally work to remove sponges and other “prey” from the surface of the reef, which affords the reef fish better access to feed. The Hawksbill Sea Turtles have cultural significance in the region and have considerable economic value locally as a tourist attraction. 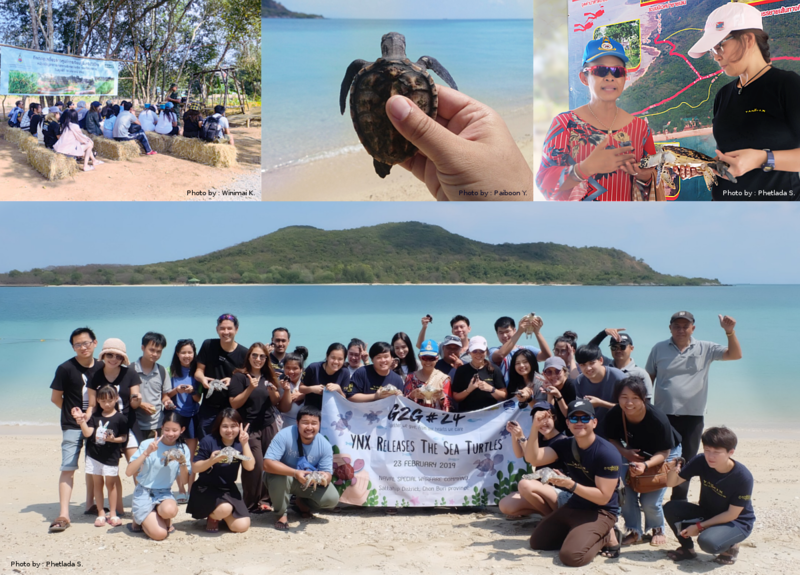 The day culminated in the release of 28 baby Hawksbill Sea Turtles by the Yannix volunteers under the leadership and supervision of Mrs. Sasivimol Youkongkaew. Suffice to say, Give It 2 Get It #24 was a day of learning and interaction with nature. Yannix thanks Naval Special Warfare Command Royal Thai Fleet, Siam Marine Rehabilitation Foundation, Mrs. Sasivimol Youkongkaew, Chief Petty Officer First Class Viratpon Masphan, Chief Petty Officer First Class Thongchai Chookhanhom and everyone who helped make Give It 2 Get It #24 an amazing experience.